1. In a medium pot, cook grits according to package instructions. Stir in cheddar and season with salt. 2. Meanwhile, in a large skillet, melt 1 tbsp butter over medium. Add scallions and chipotle and sauce; cook, stirring, until scallions are tender, 4 minutes. Add broth and bring to a simmer. Add shrimp and cook until opaque throughout, 3 minutes. Stir in lime juice and remaining 2 tbsp butter* and cook until sauce is slightly thickened, about 2 minutes. **Season with salt. Top grits with shrimp and sauce. 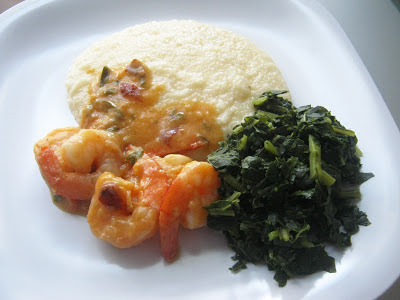 Notes - *the only changes I made to the above recipe was to add 2 tbsp flour to thicken up the sauce (after adding the last 2 tbsp butter), and ** I also added about 2 tsp sugar to the sauce when seasoning with salt.